Yesterday saw the launch of an initiative in New York called the “100% Clean Label Movement” which has been founded by Scandinavian entrepreneurs Mika Manninen and Helena Lumme who also head Hälsa Foods. Lumme and Manninen have a background in Scandinavian food which allowed them to analyse various shortcomings in the US food industry. They stated: “Natural food brands are doing many things right, but they haven’t gone far enough to offer the American consumer 100% clean food, since many products still contain artificial ingredients. With our 100% clean label Hälsa Oatgurt we are raising the bar, and showing it’s possible to make plant-based beverages without using a single artificial ingredient,” adding that it took them four years of research to develop this clean line of dairy-free products. A report by Innova Market Insights showed that 75 percent of American consumers regularly read food labels and almost all these people strongly agree that labels should contain recognisable ingredients, with 91 percent believing that those food and drink products whose ingredients are easily understandable, are healthier. Also, in the UK, a study by Animal Aid found that customers are more likely to purchase products which are clearly labelled as vegan or plant-based. To read more about Halsa products you can visit their page here. 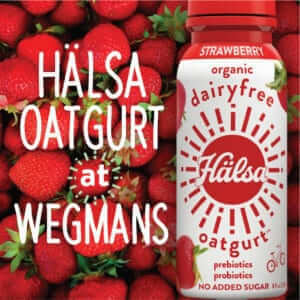 Hälsa is Swedish for health, and is America’s first Oatgurt, available in three flavours and Hälsa retailing at $2.99 at Wegmans Food Markets and other health stores around New York City.